The seeds of Cardamom plant, Elettaria cardamomum, are a spice which has traditionally been used in Asia and Europe to flavour meat, curries and bread. The leaves are also used to flavour cooking. 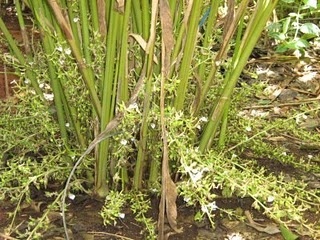 The immature seed capsules are used as a remedy for heart-burn, indigestion, nausea. The seeds and capsules were considered a folk aphrodisiac in Asia. Aromatic leaves used in pot pourri. Cardamon plant is native of South India and prefers warm, rich, moist soils in a protected, shaded position. Drought and frost tender. Light frosts are not a problem. Grows to 3m x 1m. Be the first to review “Cardamom, True plant” Click here to cancel reply.